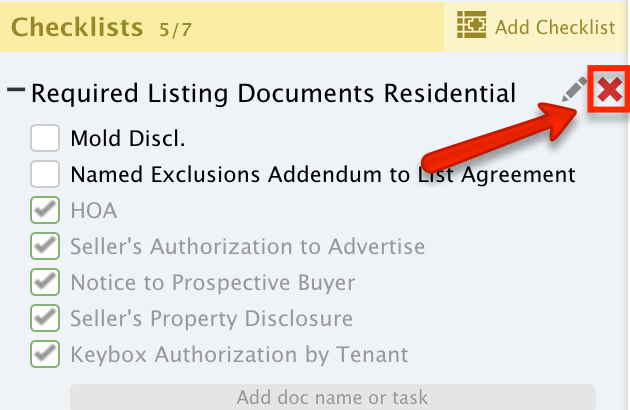 Checklists are a great way to help your team keep track of tasks and required documents for a transaction. This article will show you how to add a checklist to a transaction. Short Version: 1) Open a transaction. 2) Click "Add Checklist" from the left column. 3) Select the desired checklist. Go to the transaction and click [Add checklist] from the left menu. Select the desired checklist template from the dropdown list. The selected checklist will be copied to the transaction and may be further modified if needed. Add more checklists by selecting them from the same dropdown list. Checklists can be collapsed and expanded by clicking the plus and minus icons, rearranged by dragging them to a different position, and removed by hovering over the list and clicking ‘X’. Hover over the task and click the [Eye]. Select the appropriate visibility option. From a Checklist, click the [Calendar] and select "Relative Date". Enter the appropriate values to build your rule. Click [Set Date Rule]. These date rules will be resolved into actual dates whenever the date for the defined trigger activity is present on the transaction. Click “Add Doc Name or Task”. Check the box on its left. This will also update the completion percentage of the transaction. Agents will typically notify an admin when a task has been completed so that the admin can return to the transaction to verify things and mark that task as completed. Hover over the checklist and click the [Pencil]. Make the desired changes then save. Remember: you’ll have to first open an existing transaction’s page or create a new transaction before adding a checklist to it. Hover over the checklist and click the [X] that appears to the right of the checklist. Confirm the deletion of the checklist by clicking [Delete].